DIRECT FROM LOURDES - 18 Carat Gold Plated Miraculous Medal Bracelet. 18 Carat Gold Plated Miraculous Medal Bracelet. 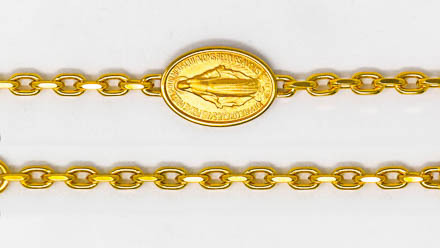 This is an 18 carat gold plated bracelet with a miraculous pendant in the middle. The front side of the pendant has an image of Our Lady of Lourdes (Virgin Mary) and on the opposite side it has the traditional "M" surmounted by a cross which is surrounded by hearts and stars. The bracelet measures 19cm in length and the pendant measure 20mm in lenght.